Make your summer even bigger with KAMERS. 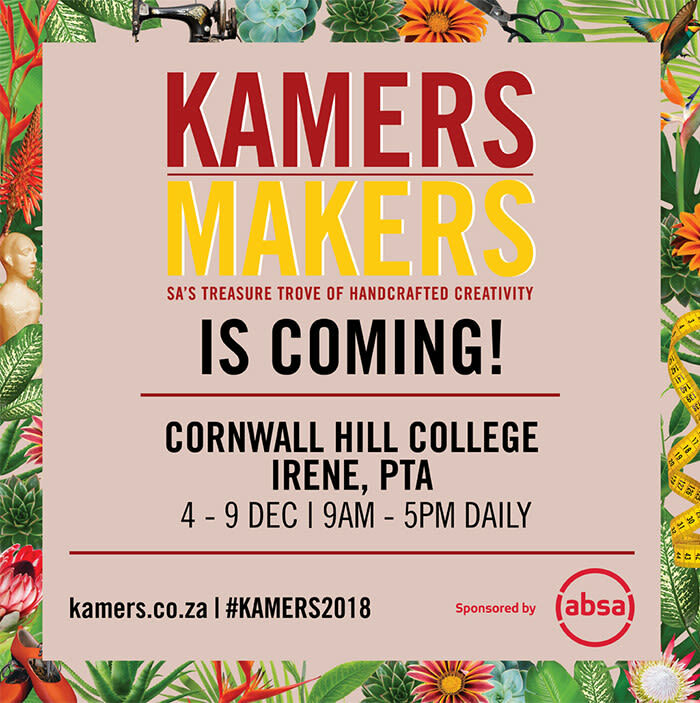 SA’s premier celebration of handmade, proudly local products returns to Pretoria from the 4th to the 9th of December, and for the first time in 8 years, KAMERS/Makers Irene is moving to a brand-new venue – at the Cornwall Hill College. You could walk away with 1 of 10 summer hampers on 702, consisting of some of the market’s most innovative designs and products, up for grabs. For a chance to win, call in every time you hear “702 summer campaign” on-air and you could be 1 of 10 people to make their summer big with KAMERS. Listen to 702 from the 3rd to 14th of December for a chance to win. This competition runs on 702 from 03 December – 07 December 2018. The competition runs on the daily shows. The listener will win a Kamers hamper. Prizes are not transferrable and cannot be exchanged for cash. Participants will be randomly selected. The judges’ decision is final, and no further correspondence will be entered into. The prize is not negotiable, and not transferrable. 702 and KAMERS will not be held liable for entries not received for any reason whatsoever and will not be responsible for network connectivity or hardware issues experienced while participating. A participant will not be able to win this competition if they have won a prize on 947 within the past 90 days, whether on-air, online or via any of the station’s social platforms. If a winner chosen does not comply, their entry will be disqualified, and a new winner will be randomly drawn. If a winner cannot be successfully contacted, is ineligible to accept the prize, or contravenes the terms and conditions of this competition or of 702 and Tsogo Sun, the prize will be forfeited. 702 reserves the right to cancel or amend the competition and these terms and conditions without notice. Any changes to the competition will be notified to participants as soon as possible by the promoter. Employees of KAMERS, Primedia Broadcasting and their immediate family and friends, are not permitted to enter the competition. By entering this competition, a participant is indicating his/her agreement to be bound by these terms and conditions. All other standard terms and conditions apply.